The first regiment to be titled Grenadiers in the British Empire was not the Grenadier Guards in the Household Division but a Bombay infantry regiment. In 1778, a composite battalion made up of 2 grenadier companies from each of the 2nd, 3rd and 5th Bns of Bombay sepoys, earned glory for themselves and the Bombay Army against the Mahrattas at Talegoan near the present Bombay-Poona road. In 1779 grenadier companies from the 6 existing sepoy battalions, plus 2 companies from the Bombay Marine Battalion, were formed into one battalion and called the 8th Bombay Native Infantry. A few years later the 8th was part of the garrison of Mangalore on the Malabar Coast, then besieged by the army of Tipu Sultan of Mysore, and despite being outnumbered by a force 70 times its strength, the British-Indian troops held out for almost 9 months before capitulation with honour. The only other regiment to share the battle honour of Mangalore was the 42nd (Black Watch). The title of Bombay Grenadiers was officially given in 1784 and in 1788 they were granted the badge of the White Horse of Hanover but they did not become the 1st regiment in the Bombay line until 1796. Many regiments have the battle honour Afghanistan 1878-80, but there should surely be a seperate honour for those that fought at Maiwand. 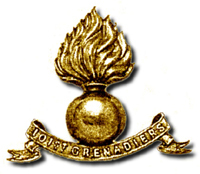 The 1st Grenadier Regiment was amongst those who made the last desperate stand. They were commanded by Colonel Anderson who rallied his men time after time. !n 1903 they were renumbered 101st. At this time there were three officers serving in the regiment who held the VC, probably a record unequalled in the armies of the Empire. They were stationed at Bangalore and comprised 2 companies of Dekhani Mahrattas, 2 of Konkani Mahrattas, 2 of Rajputana Muslims and 2 of Punjabi Muslims. In WW1 they were in German East Africa, Egupt, Palestine and Somaliland. A second battalion was formed in 1917 which was in Egypt and India but disbanded in 1921. The amalgamations of 1922 brought the 101st into the 4th Bombay Grenadiers with 5 other regiments who were ordered to wear a 4th cap badge, but the 101st, who were the 1st battalion, were allowed the distinction of their own badge. They went to the Frontier and joined the Mohmand Field Force under Brigadier Auchinleck. Later, as Field-Marshal Sir Claude Auchinleck and Commander-in-Chief of India, he became the Colonel of the Regiment. Their WW2 service was in India, Iran, Iraq, Egypt,Lebanon and Syria. In October 1945 the 4th Bombay Grenadiers was redesignated The Indian Grenadiers and alloted to India on Partition.